Animals Seen But Not Hunted: Forest Elephant, Bates Pygmy Antelope, Gorillas, Chimpanzee, Bay Duiker, Dwarf Buffalo, many monkey’s. Booked with: Adam Clements safari Trackers Inc. I (Adam Clements) just returned from a hunt in the forest of Cameroon and can only say that it was one of the best experiences and adventures that I have been on. I have hunted all over Africa, and have shot most of the animals in Africa, but I had yet to get the Bongo which was next on my priorities. There is so much to say and talk about, but do not think that I will be able to explain the exact experience by words. 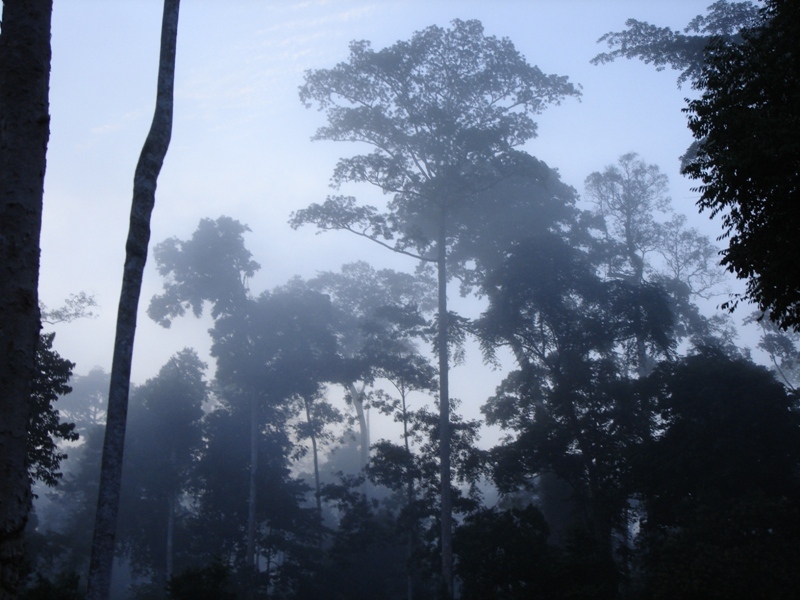 The rain forest is a special place and nothing like I had ever experienced before. 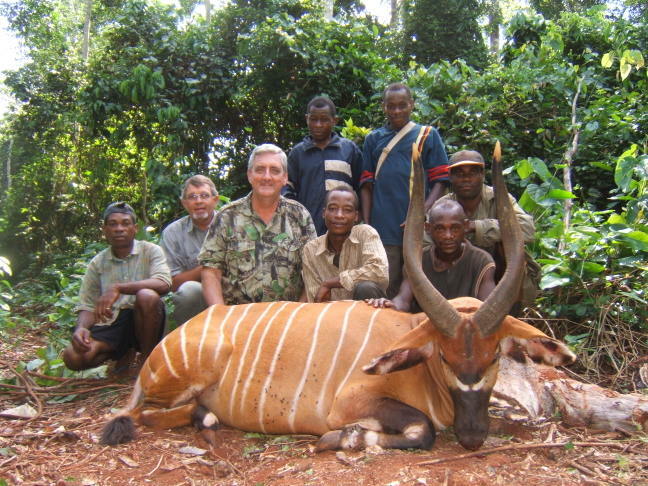 This is a very specialized hunt, and you pretty much go to hunt for the Bongo. Any of the other species that are there will just be an extra bonus if you happen to get them. So, you do not go there expecting to do a lot of shooting, but simply to go and to get one of the worlds most beautiful animals, the Bongo. Pictures do not do this animal justice, and until you set your eyes on a Bongo up close in the forest, you will never realize how beautiful and how special these animals really are. I am very happy that I was privileged to go and do this hunt, and would highly recommend it to anyone looking for a special experience. 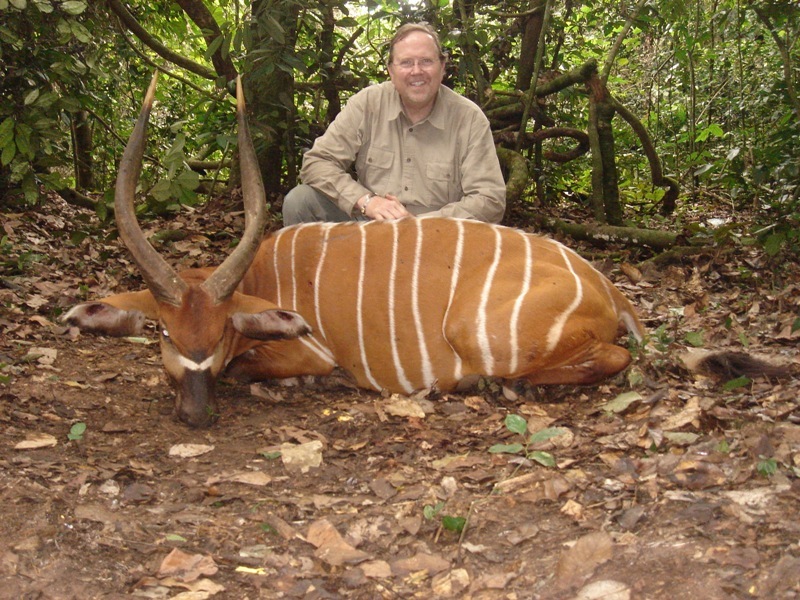 I have always been fascinated by this beautiful elusive big orange antelope; I booked this hunt for bongo, forest Sitatunga and duikers in the rainforest of Southeastern Cameroon for April 15-30 of 2006. 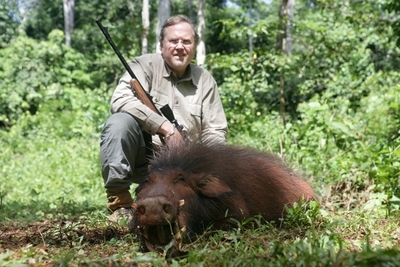 The hunt, on the Mongea concession owned by Pierre Guirrini of Paris, France, who also owns Faro West in Northern Cameroon, was arranged of course by Adam Clements Safari Trackers Inc. 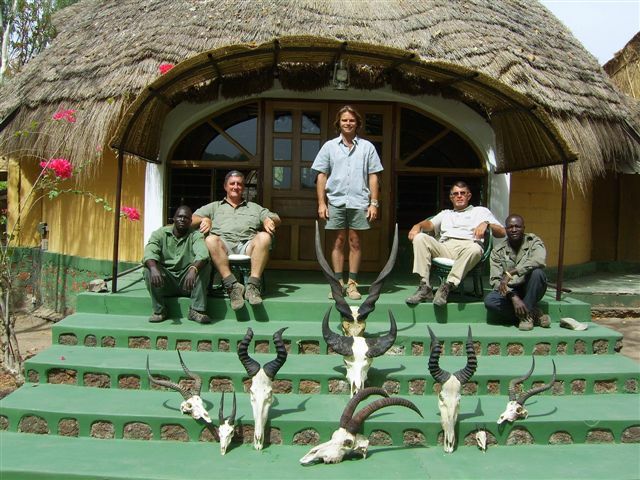 I have been working with Faro West for the last 5 years, and all of my clients have enjoyed 100% success rate on both the Eland and Bongo hunts. Entering the country at Douala, we overnighted at the LeMeridien Hotel and next day took a two hour charter flight to the lumber company airstrip at Libongo just across the Sangha River from the Central African Republic. Here my professional hunter Orlando Cardoso met me. Orlando and I have known each other for many years, and we would have a great time together no matter what the outcome would be. 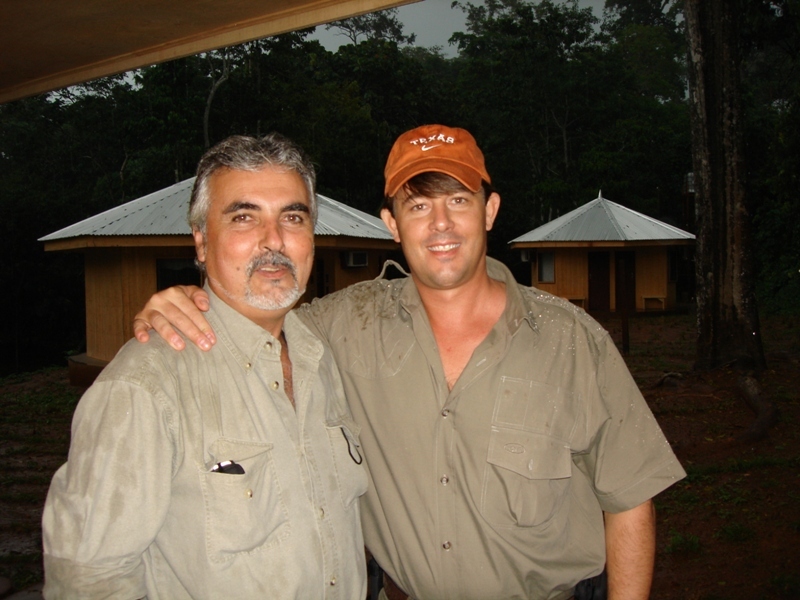 Dr. Jan Bax would hunt with Francois Taljaard. After collecting our gear we journeyed for at least an hour over red dirt lumber company roads to camp. Another side note here would be that our guns did not arrive with us on Air France when we arrived in Douala. We were lucky however, as the guns did arrive the next night, and there happened to be another charter plane going into the Libongo airstrip from the timber company. So, we were 1 day of hunting without our guns, but would have used the PH guns if we needed to. I would advise clients to arrive a day early just in case of guns not arriving. Camp, located in a grassy clearing on the tiny Mongulle River, was carved out of the forest five years ago. Facilities consisted of wood chalets, all with tin roofs to withstand the hundreds of inches of rainfall experienced each year. 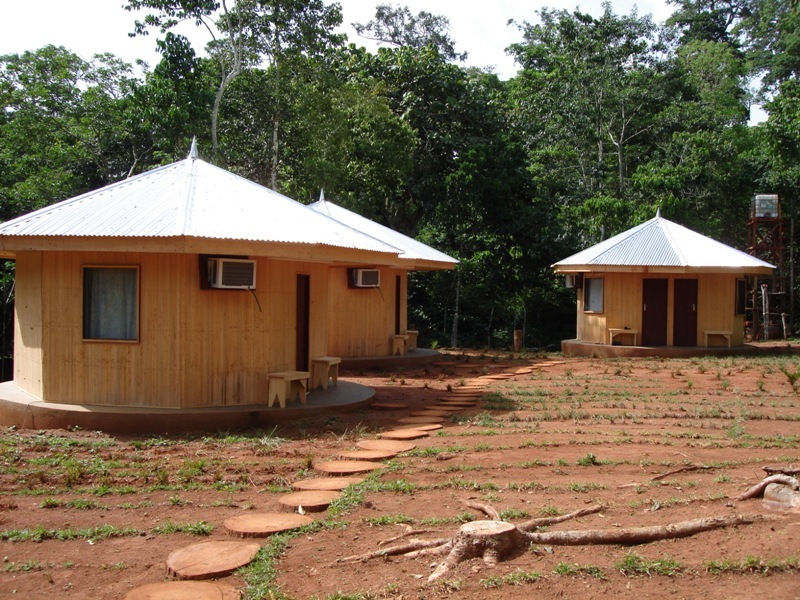 There was a dining facility also made from wood and tin roof, two client chalets all furnished with bathrooms with flush toilets and showers, a wood frame cookhouse and another used as quarters for the PHs. A skinning and taxidermy structure and a metal ships container used for storage also were present. The camp is comfortable and very simple, not luxury by any means, but enough. The chalets and dinning room did have air conditioning which was a big bonus, as it made time at camp more comfortable and enjoyable. Camp staff consisted of Bantu from Northern Cameroon, who also worked in Faro West’s Lord Derby Giant Eland camp, and local pygmies. The Bantu served as cook, laundryman, drivers, and skinner while the pygmies were the trackers and general laborers. The main duty of the laborers was to maintain the roads. The pygmies lived with their families, including 25 to 30 small children, in a small village on site. They supplemented their diets of meat from the hunting operation with garden crops. In addition to growing cassava, bananas, papaya and many other fruits and vegetables, they grew marijuana for their personal use. The pygmy trackers were constantly foraging for edibles during the course of the hunt collecting lizards, small crocodiles, mushrooms, poki (honey), and favored plants from the forest as they worked. The concession officially named Mongea, consisting of nearly 200,000 acres is located in the Southeastern corner of Cameroon. 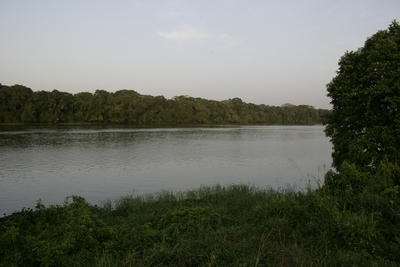 It borders the Sangha River on the East which also is Cameroon’s border with the Central African Republic. 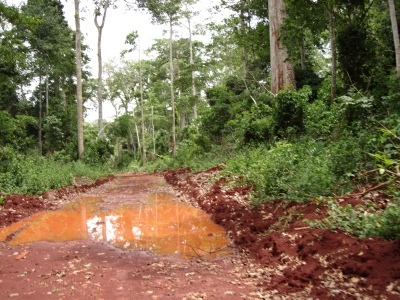 Its Southern border is the Northern boundary of Cameroon’s huge Lobeki National Park. Many of the old logging roads that now are really just trails through the forest are used for access to the concession for hunting. After the growth is chopped out of a trail and its shoulder, it only takes a month or two before regrowth chokes the road to near impassability. All maintenance is done by hand. There are no mowing machines, no graders or heavy equipment available for this purpose. 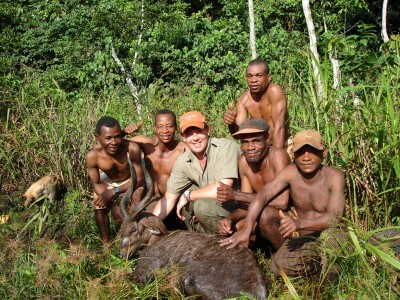 One of the most interesting experiences of this hunt was the opportunity to work with the pygmy trackers. They were friendly and cooperative and enjoyed hunting and the excitement of the hunt. Short in stature, our trackers varied from barely four feet to nearly five feet in height, they can more easily walk and stoop under, in and around the vines that are found everywhere in their world. Slim and light in weight, our trackers varied from 65 to 85 lbs, they can better cope with the stifling heat of the forest than we can. 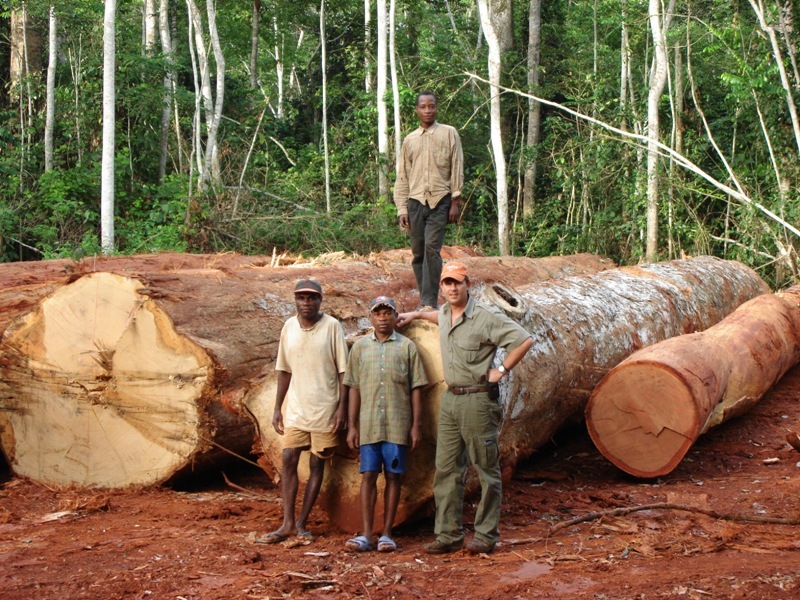 In addition to their native Baaka language our trackers also could communicate in French. The pygmies are known as some of the continent’s most skilled trackers. They can follow animals through all kinds of terrain and all types of vegetation under almost any condition. An equally valuable skill is their ability to accurately determine the age of a track. Because tracking is so important to hunting forest species, it is absolutely essential to know the age of a track before embarking upon a long tracking exercise through highly inhospitable habitat. It is futile to follow day old bongo or dwarf buffalo tracks, for example. 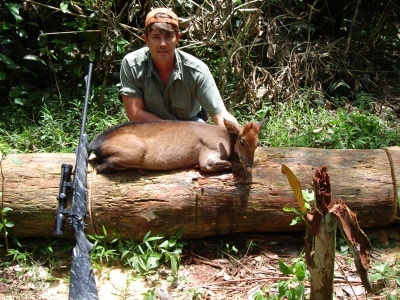 My goal on this hunt was to collect a Bongo, a Sitatunga and duikers in that order of priority. We would concentrate our efforts initially on Bongo, and if any other opportunities came around, we would take them. One thing that you learn in the forest is that you have to have very quick shooting skills, as you do not normally have a lot of time when an animal presents itself. The Bongo is normally okay as the dogs hold the Bongo at bay, and you normally have time to judge the animal and make a good shot. You may even be lucky to catch a Bongo on one of the roads. When calling in duikers, they come running in, and you have about 3 seconds to get a shot off, not knowing if they are male or female. It is legal to shoot females in Cameroon, you just have to pay a double trophy fee. If you catch a Giant Forest Hog in the road, you normally do not have much time and you have to make a quick decision and shoot. When tracking for Buffalo, you will be so close to the Buffalo when it is seen, that you also have to make a quick shot before it vanishes in the thick forest. 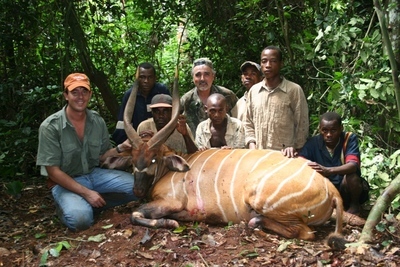 The Bongo, is the largest of the forest antelope. A mature bongo bull stands up to four feet tall at the shoulder and is bright chestnut red to orange in color with 10 to 13 white vertical body stripes. A mature male weighs 400 to 500 lbs. It has a white, orange and black spinal crest, unusually big ears and thick massive smooth lyre-shaped dark brown horns with ivory tips. Its muzzle, neck, ears, under parts and legs are marked with black and it has a white chevron between the eyes. There are two white spots on its cheeks and a light yellowish white crescent band on its lower neck. Its tail is long with a terminal brush of long black hairs. It is one of the most beautiful antelope in the world. The Bongo is mainly nocturnal and very elusive, although we did see some in the mornings. They are among the most difficult of all the African game animals to hunt, primarily because of where they live -- the almost impenetrable rainforests. In the forest-savanna margins they sometimes are found in the fingers of forests, called bakas, running into the savanna along river courses. They are hunted almost exclusively by tracking. A Bongo bull is ranked among the world’s most coveted trophies. 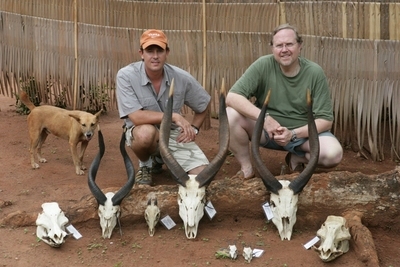 There has been some discussions on how to hunt bongo and if dogs are ethical. Well, I personally can tell you that even when using dogs, it is not an easy hunt and still very challenging. I think that it is more ethical and challenging to track a bongo through the forest and then bay it with dogs, than it is to shoot one standing in the middle of the road or from a machan. There is nothing wrong at all using dogs on bongo, and personally would not do it any other way. It takes a lot of skill from both the trackers and the dogs to get a bongo, and it is very challenging and fun at the same time. The forest Sitatunga, is a medium sized antelope that lives in and around the swamps and small lakes found in the forest. A characteristic feature of the Sitatunga is its long splayed hoofs and which enable it to walk on soft boggy ground and on mats of marsh vegetation without sinking deeply. The Sitatunga, truly an aquatic antelope, lives in swampy areas and browses on the leaves and fruits. They are strong swimmers and can submerge completely with only their nostrils protruding above the surface. The forest Sitatunga occurs only in small numbers and is a rare and highly prized trophy. The Dwarf Forest Buffalo, is a smaller edition of its close relative the Cape Buffalo. Standing three and one-half to four feet at the shoulder, a mature Dwarf Buffalo bull will weigh 450 to 600 lbs. Their body hair is reddish in color and their horns are small curving upward and outward with no central boss. They most often live in small family groups consisting of three or four animals. Nocturnal, they are very elusive with a superb sense of smell. They are said to be very aggressive when approached at close quarters as they must be when hunted in the forest. Our routine during this hunt was to get up at 5:00 AM, eat breakfast and go hunting at 6:00 AM. We’d hunt until noon, unless we were following tracks at that time, and return to camp for lunch and a rest during the hottest part of the day. We’d start hunting again at 4:00 PM and hunt until dark. 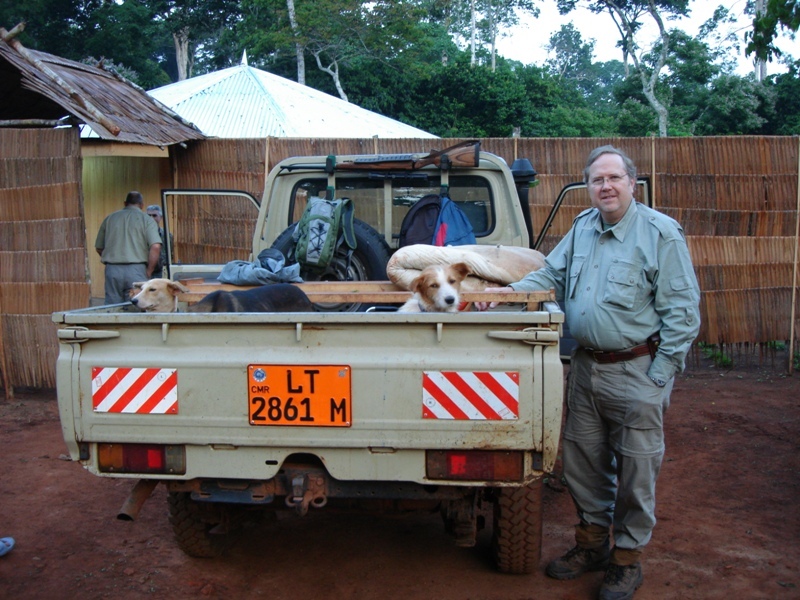 Our hunting vehicle was a Toyota Land Cruiser with a seat on the bed for the trackers. Each vehicle would have 5-6 pygmies of which each had their own dog. With any great pygmy tracker, there is a great hunting dog, as you need both to be successful. Orlando my PH would drive, and I would sit up front with my gun ready at all times. We’d travel the roads looking for Bongo tracks in the morning. If fresh tracks made by a large bull were found, they were followed until contact was made or further tracking deemed hopeless. In the case of Bongo, we would have three dogs loose running around in front of us, as well as 3 dogs that were kept on a leash. We would track the Bongo until the loose dogs jumped it in front of us, at which time, all the dogs were turned loose. The dogs would bay and hold it long enough to be identified as a shootable bull or not. It often happens that you may be on a big bull track, but then jump a female or younger bull which had crossed the track we were following. In this case if it is a female or young bull, we would terminate the hunt and it would take about 30 minutes or so to get all the dogs away and to head back to the truck. The rule of thumb is if a Bongo has horns of 27 inches or longer in length, the hunter should harvest it rather than turn it down with the hope of finding a bigger one. Trust me, after several 3 hour tracks in the thick forest, any mature Bongo will look very good to you! The pygmies hunting dogs are small, terrier sized, short-haired animals coming in all combinations of black, white and tan, with a pleasant disposition toward people but with a ferocious attitude when released in the presence of Bongo. They hunt by sight and sound rather than smell and their small size enables them to move through the forest under the vegetation very rapidly. When a Bongo has been bayed by the dogs, they circle the embattled animal pestering it from all sides. The bongo stands his ground and fights them off with its horns. The dogs do sometimes get injured or even killed by the Bongo. 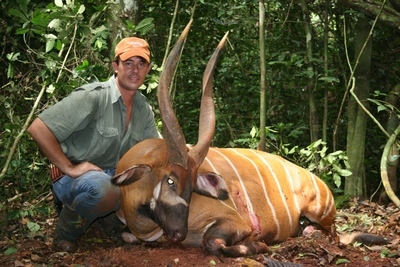 The Bongo is actually a very dangerous animal when bayed and should be taken as a serious threat. They will charge a hunter at anytime and can move through the forest faster than you can imagine. I climbed a couple of trees myself when we had bayed a female and she charged us, making everyone scatter. Another important note to a hunter with Bongo, is that you have be very careful not to shoot a dog in the excitement of shooting the Bongo. You have be very aware of the dogs and make sure you time your shot correctly. Sitatunga are most often hunted by spot and stalk techniques around the forest lakes and swamps where they live, or by tracking them with dogs as well. They also can be hunted by tracking when fresh tracks are found at a lick or a lake. It is a gamble to use dogs on a Sitatunga as it will either keep running from the dogs and get away, or if it turns to fight the dogs, there is a big chance that the dogs will kill the Sitatunga before you can get there. 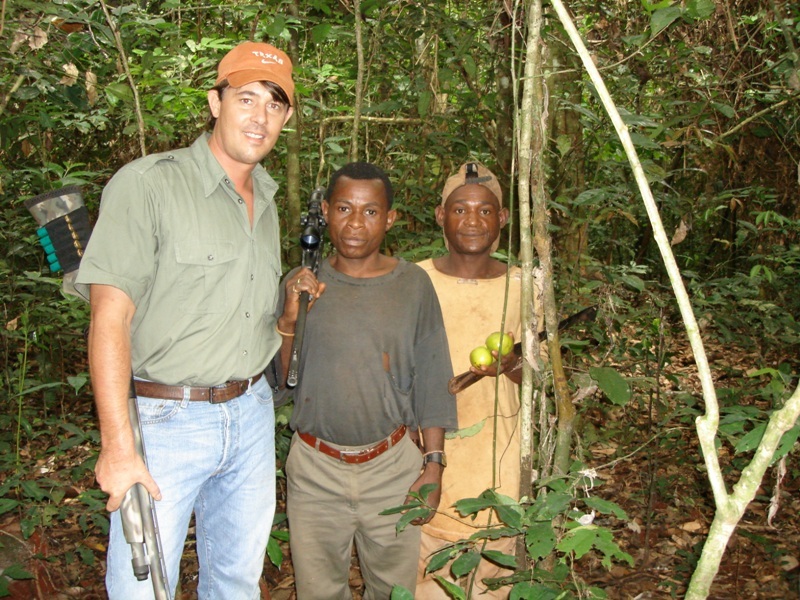 On my Sitatunga hunt we did use the dogs however and it was very successful. Dwarf buffalo are hunted purely by tracking. 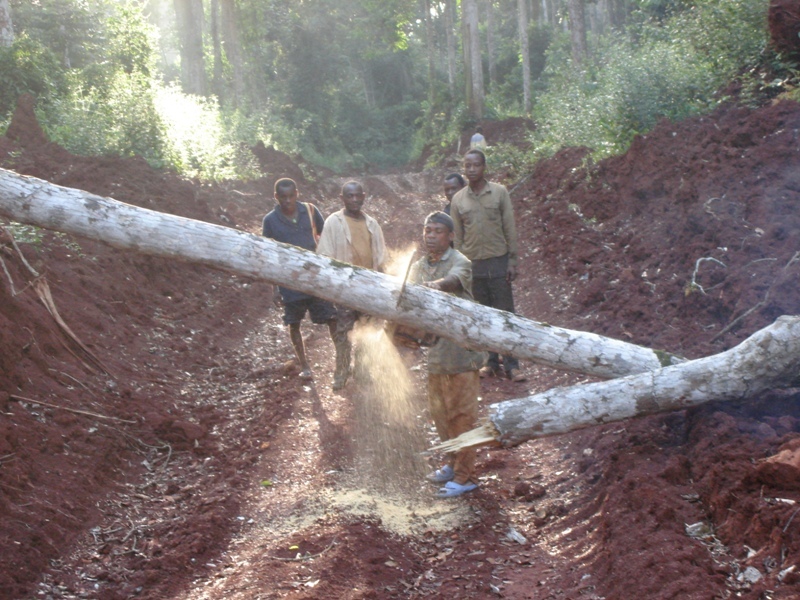 The forest roads are scanned for fresh buffalo tracks and when they are found one follows the tracks to the buffalo. Buffalo are very alert and elusive and it is very difficult to stalk them. 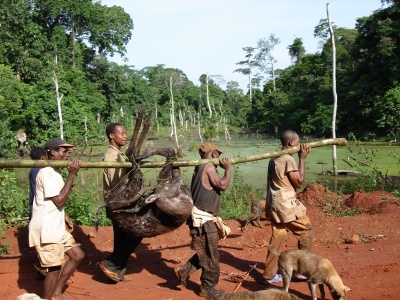 Poaching is a serious threat to the game animals of the forests of Cameroon. 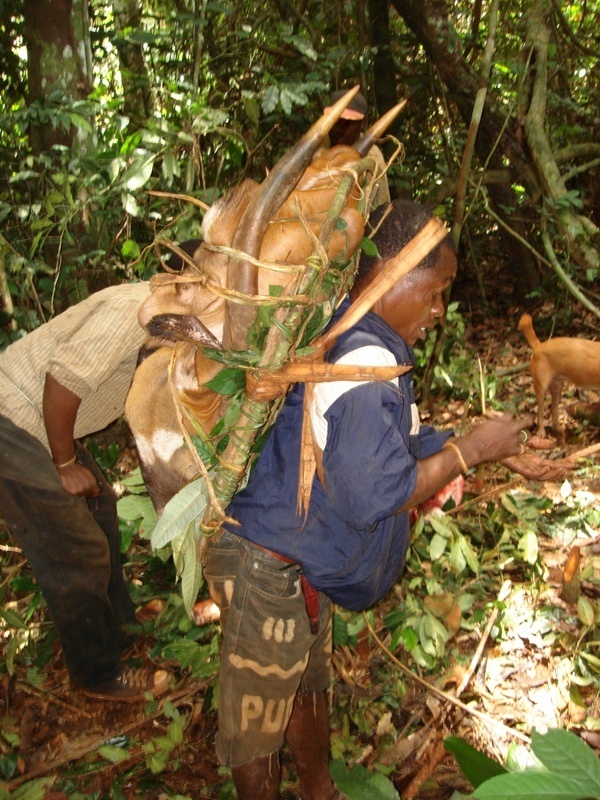 Bush meat i.e., meat from the wild animals living in the forest, is a staple of the diet of Cameroonians. By law every Cameroon citizen is entitled to a duiker per day. This means that at any time they can have one duiker in possession. When that one is gone i.e. traded or eaten they can legally get another. Bush meat is sold openly in the villages and towns and served in restaurants. Much of this meat is obtained from professional poachers whose business is harvesting meat animals by any means possible. The most common technique of the poacher in the rainforest is the use of snares made of cable wire. The snares are ingeniously set and very deadly. 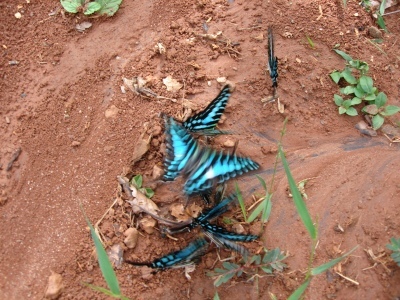 A poacher may set 50 to 100 snares on a single run, returning later to harvest his catch. When he has enough meat or the snares are not sufficiently productive he often leaves the area abandoning the snares in place to continue to catch animals. The good news though, is that they do not poach for bongo, Sitatunga, buffalo or forest hog. Although these animals will step into the snares that have been set, they normally are able to break the snare which leaves them with a snare or scar on one of their ankles. 99% of bongo that are shot will have either a snare or a scar from a snare on its foot. Most of the poaching is for duikers, but luckily they reproduce very quickly. There are a lot of duikers there, and we had no problem at all calling in duikers, or seeing them on the roads. 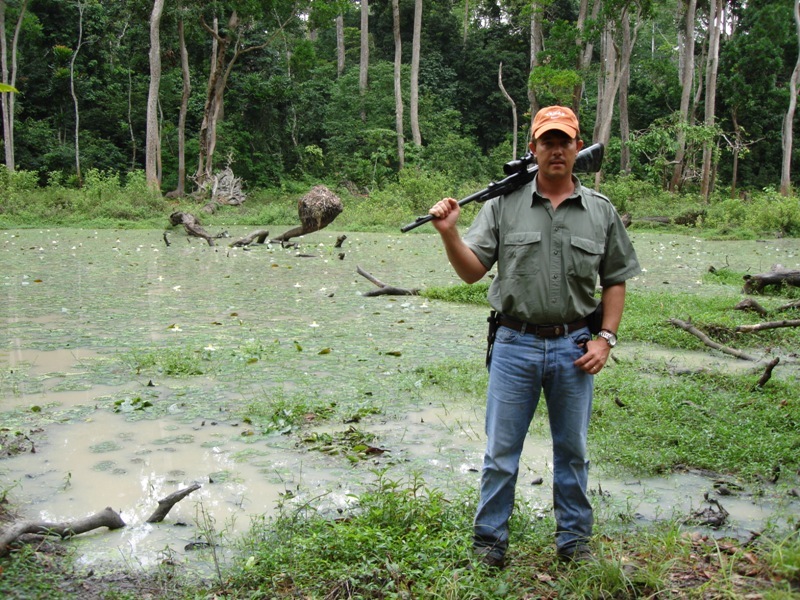 We saw very few animals during our hunt largely because of the dense foliage. The duiker; Blue, Bates pygmy, Peters and Yellow Backed, were encountered on the roads generally with one or two seen each day. I was lucky enough to see 10 Bongo on the road one morning while driving around, and they did not seem to be bothered by us at all. Bongo, however, are largely nocturnal and according to the number and variety of fresh bongo tracks seen on the roads each morning they undoubtedly were present in good numbers. Forest Sitatunga, although very scarce based upon the number of fresh tracks found looked to be in good numbers in favored habitat. 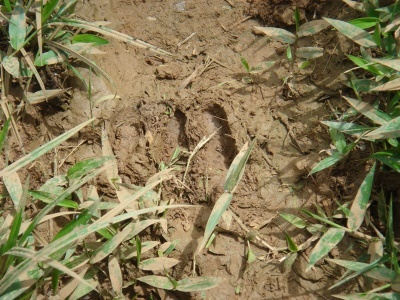 Dwarf buffalo are normally never seen except when tracked, but a lot of fresh tracks were found on the roads from time to time. I also was lucky and did see a dwarf buffalo in the road one morning. The Dwarf Buffalos’ home range is smaller than that of the Bongo so they probably do not cross roads as often as Bongo do. We actually saw only one herd of Elephant, and one lone bull, but based upon the number of tracks we saw they were quite plentiful. We saw silverback Gorilla often, Chimpanzee occasionally and monkey frequently. The odd monitor lizard and crocodile was spotted. I saw only two poisonous snakes during the entire hunt, a Gabon viper and a Green Mamba. I have never in all my travels been to a place with more butterflies than I saw here. The weather was hot, in the 90°s F and very humid during the daytime but cooled down to the 70°s F at night. It rained four times in the two weeks we spent in camp. Each time the rain fell in huge quantities for 2-4 hours or so, then it cleared up. The temperature following a rain was noticeably cooler than at other times. Many mornings were misty and most days were partly cloudy and sunny. It was considerably cooler in the shade of the forest than out in the open where one was exposed to the sun. Day 1 – We pretty much just drove around getting the lay of the area and looking for tracks. It was very dry when we arrived as they had not had much rain up until then, so was had to see fresh tracks. Day 2 – We had just left camp when it started to rain, so we all returned to camp while the downpour continued for about 4 hours. This was very good, and rain is always welcome in the forest when hunting. Without rain, the hunting is very hard, and rain is needed at least every 3-4 days if possible to wash all the old tracks away, and make new tracks easy to see. After the rain, we drove around for a little while to see if we saw anything on the roads. Usually after a rain, animals will come to the roads to dry off. We did see one bull forest elephant, then returned to camp for the afternoon. At 4pm we left camp to call duikers. It is amazing how the pigmies can call in the duikers. 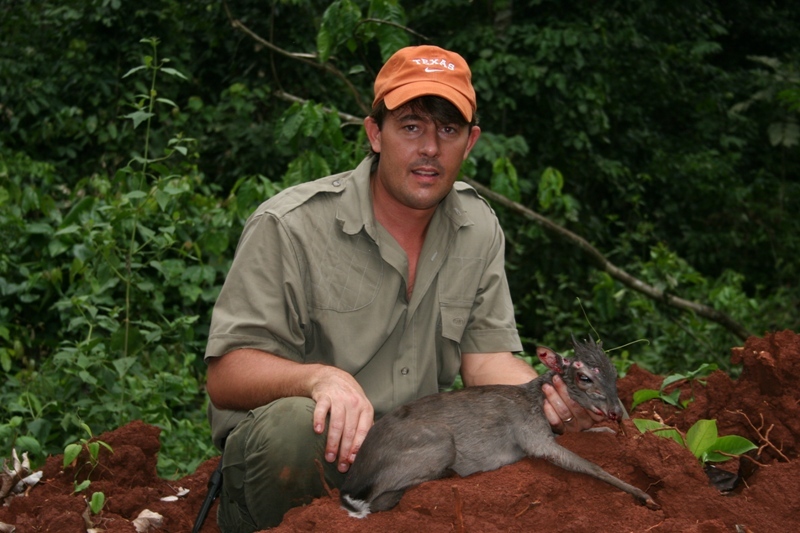 I managed to shoot a Blue Duiker and we headed back to camp. Day 3 – Since we had fresh rain on day 2, we were excited about this morning. We found a nice fresh bull track at around 7am and the pigmies were excited about the track, so I was too. 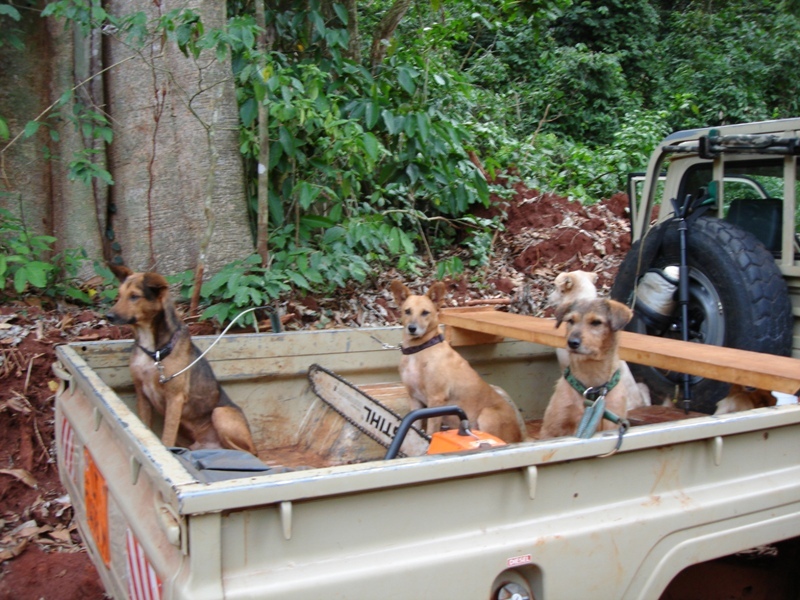 Six pigmies and their dogs headed off into the forest with Orland and myself following. We followed the tracks through the forest, through rivers for about 3 hours when we suddenly heard the great sound of one of the dogs start to bark ahead of us. Then all the dogs started in and a big commotion about 50 yards in front. We ran as fast as we could toward the dogs forgetting about all the thorns and vines. Finally I could see the beautiful orange color of a bongo through the thick vegetation. 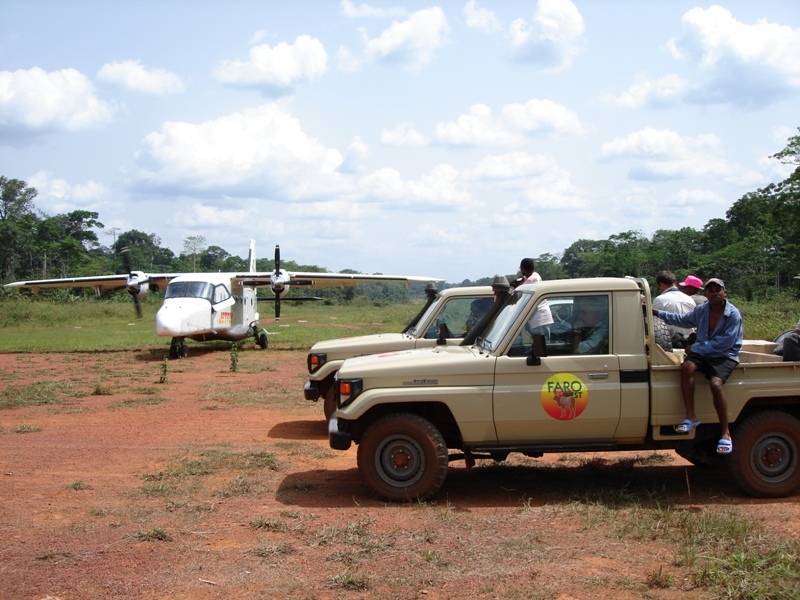 Just as we got into position, the Bongo broke and took off running. The dogs stayed on the great bull and brought him to bay again only about 40 yards away. This time it was a little more open and we could clearly see the entire Bongo standing their. The site of this Bongo was just amazing and all of a sudden the horn length did not mean anything to me at all. I just wanted to have one of these beautiful animals and I did not care at all how big the horns were. Orlando was trying to tell me that he thought the bull would go around 28”. I had earlier told Orlando that I would like a 30” Bongo if possible, and he told me that he would talk to the witch doctor and see what he could do. Now, I could care less what the size was! He told me to shoot the Bongo if I wanted it, or we should back away, as it attempted to charge in our direction. I went to my knees in order to have a lower shot so that I would not be shooting down towards the dogs. Dogs do get killed by clients, because when and if the bullet does exit it will then hit a dog on the other side. So, again, I was being as careful as I could be and when I saw that there was no dogs on the opposite side of the shoulder, I fired my .375 H&H with a 300 grain bullet. The Bongo turned and ran off a short distance with the dogs hot on its trail before we heard him fall. 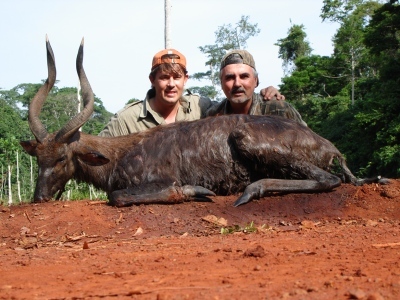 The Pygmies were already with the downed Bongo to make sure the dogs stayed clear and did not harm the skin. From the time the dogs barked and the time the Bongo fell down, it was only a matter of about 1-2 minutes. When I laid my eyes on my beautiful Bongo trophy and could sit there and touch it in person, I can not express my feelings and my joy for having this experience. We took pictures, drank some water, then the Pygmies skinned the entire Bongo. They made their own caring baskets that they would strap to their head and would carry the entire horns, skin and all the meat out of the forest. Nothing was left behind. It only took about a hour to cut to the nearest road, then back to camp singing the entire way. We took the afternoon off and enjoyed the moment of hunting the most beautiful animal in Africa. Day 4-7 – Not much happened and just drove around and hunted for duikers and looking for Siataunga tracks. One experience I can mention here is with a Gorilla. We saw several Gorilla during the time I was there, and we would normally catch them way up in the trees, where they would then make a lot of noise and slide down the trees, not to be seen again. On one evening when we were walking to an open savannah to see if we could catch a Forest Hog in one of the salt licks, something very interesting happened. 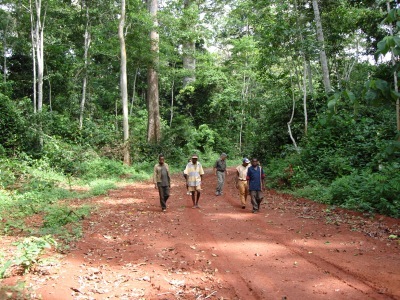 While we were sneaking along the trail to the open savannah, the pygmies told my PH that they smelled Gorilla. It was a very strong smell, but did not think anything of it, until I heard the most heart stopping scream I have ever heard. We had just walked into a big silver back Gorilla who was going to make sure that he let us know we were in his territory. The pygmies just disappeared in the forest and I was left standing there with Orlando. Being a PH myself, I already knew never to run and to stand my ground, but I was dealing with something totally new of which I had no idea of their behavior. I automatically raised my rifle, but Orlando just stood there like a statue, so I did as well. This Gorilla came running at us so fast and screaming so loud and tearing down trees and bushes as it came, that I really thought he was going to tear us apart as well. He came so close to us before he stopped, that you could almost smell his breath. He let out another big scream which would have made anyone mess their pants. He then turned and walked away as though telling us he would give us 10 seconds to get the hell out of his territory. We slowly backed away trying not to run, until we had some distance, then turned around and quickly walked back to the car, where the pygmies started to re-appear from the forest. I can tell you that I think I would rather a lion or elephant any day compared to a silverback Gorilla. They are just as fast, and what makes it so terrifying is the very loud screaming they do along with the breaking of trees as they come at you. Day 8 – Took a nice Peters Duiker this morning that we caught standing in the road. Day 9 – We found fresh Sitatunga tracks and decided to try tracking it with the dogs as we had doe with the Bongo. We had followed the track for about 2 hours, when the dogs started barking and we all ran like crazy towards the sound. When we got to the dogs, we found that they had jumped a Bongo and had a nice bull bayed up. We got very close to this Bongo trying to call the dogs off, so we could go back to the car. It took all of about 40 minutes trying to get the dogs away from the Bongo, when it decided he had enough and broke through the dogs right in our direction. The Pygmies disappeared, I saw Orland jumping up into the nearest tree, so I jumped at the nearest tree or bush next to me, which happened to be nothing but thorns. The Bongo ran right between us and the dogs right after him. We followed the dogs again, and again after several charges from the Bongo, we decided to just leave. After about 30 minutes walking back to the truck, all the dogs finally showed up, as I guess that they saw we had left as well. Very exciting action. Day 12 – We went back to a swamp where we had seen a young Sitatunga bull a few days earlier. When we arrived, we saw some very fresh tracks of a Sitatunga and decided to send the Pygmies and the dogs ahead along the swamp to see if they would flush the Sitatunga back towards us, or into the swamp. After about 30 minutes, we heard the dogs going crazy and the Pygmies yelling for us. We made a mad dash again through the forest on the edge of the swamp, again forgetting about all the thorns etc. When we arrived at the commotion we saw that the dogs at chased the Sitatunga into the swamp into some thick reeds and the pygmies were trying to keep the dogs from getting at the Sitatunga. The dogs had chased the Sitatunga into the swamp (swamp was about 20 acres). When we arrived knee deep in the swamp, the Sitatunga saw us and started coming right me. The dogs already back on the Sitatunga I did not want to shoot a dog, so was in a bad position of having the Sitatunga coming right at me with these sharp horns and dogs all over the place. About 3 feet from me the dogs separated a little and I had to make a shot or someone was going to get hurt. Sitatunga can be dangerous like the Bushbuck when cornered, so one has to be careful in these situations. So, I fired down at the Sitatunga which would allow the bullet to go through into the mud instead of into a dog. The Sitatunga fell in his tracks and it was over. A very interesting and exciting way of hunting, and I was thrilled to have gotten a beautiful trophy . That evening on our way back to camp we spotted a Giant Forest Hog on one of the small hunting roads. With no time to waste, I jumped out of the car and shot the hog where it stood. Was not a very big Giant Forest Hog, and was a younger male, but was happy with the trophy as they are very rare to get. Day 13-14 – Did not do much at all and just enjoyed my success of the safari. Went into the wonderful town of Libongo and that was about it. 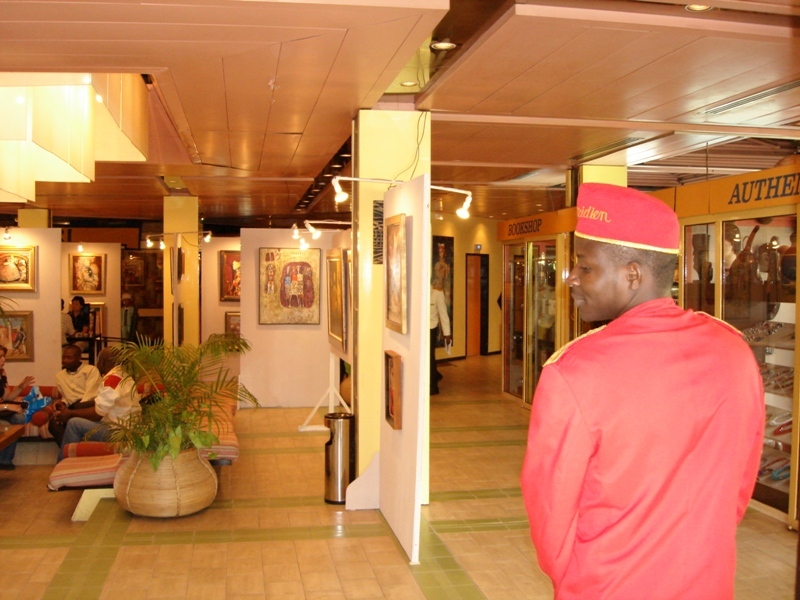 All in all, a wonderful experience and would not hesitate to go back again, and look forward to visiting Cameroon again in the future. Adam Clements Safari Trackers Inc.